MK Dov Khenin testified in defense of fellow Hadash chairman MK Muhammad Barakeh on Sunday in the trial against him over two separate alleged altercations, one during a 2005 demonstration in Bil’in (a Palestinian village in the occupied territories) and another in Tel Aviv’s Rabin Square in 2006 against the war in Lebanon. 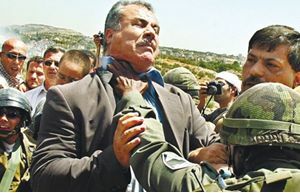 The two charges relate to allegations that Barakeh tried to help a Palestinian – arrested during a 2005 Bil’in protest – break out of custody; and that he struck a counter-protester who was verbally accosting another demonstrator, the veteran peace activist Uri Avnery, at Rabin Square in 2006. Khenin added that for him, part of being a communist activist in the anti-occupation and class opposition was regularly attending protests. 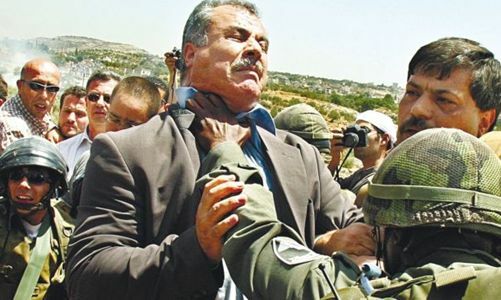 When Khenin was asked if it was prohibited to demonstrate in a closed military area in the Palestinian occupied territories, he responded “your question shows you’ve never been in a protest and I invite you to come and demonstrate with us against occupation.” He continued, saying: “What is a military closed area? January 24, 2013 in Party Life.